A new all-electric vessel concept developed by Robert Allan Limited (RAL) could produce a smoke-free solution for pilots making 'short-hop' runs to their intended vessels. 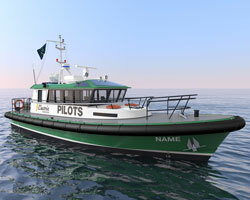 The RAlly 1600-E has been developed for distances of 5nm or less and constitutes an aluminium variant of RAL’s existing RAlly 1600 steel pilot boat design, albeit featuring the same total weight, power and speed as this predecessor, the Canada-based naval architect states. The RAlly 1600-E is set to measure 16m in length and 5m in breadth, and will feature the capacity to carry a two-man crew and four pilots. The boat’s powertrain will include two permanent magnet 750V AC motors, each rated 500kW at 2,800rpm, and these will turn 840mm propellers via either ZF or Twin Disc 3:1 reverse/reduction gears. The onboard battery system would be supplied by Spear, and would comprise a total of 70 SMAR-11N-224 modules, equalling a combined capacity of 815kWh. RAL adds: “As required by class, [the batteries] are arranged in a separate compartment which is located in the middle of the boat, between the accommodations and the machinery space.” This compartment would be equipped with a firefighting system, supplied by FirePro. As well as the obvious fuel savings and environmental benefits, including elimination of emissions, the batteries could also prove critical to greatly reducing onboard noise levels, in comparison to pilot boats utilising diesel engines.